Vietnam is a multi-ethnic country with 54 distinct groups; the largest group is the Kinh (or Viet), which accounts for around 86% of the population, with the other 53 groups referred to as the minority groups. Lao Cai province counts more than 20 minorities, with the largest being Hmong, followed by Tay and Dao. 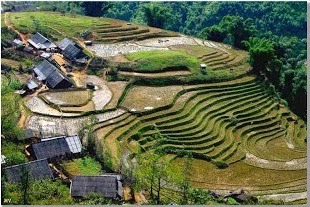 In Sapa you will come across mostly Black Hmong and Red Dao, while Bac Ha is in the heart of Flower Hmong district. As with other minorities spread across Vietnam, families of these groups tend to live in small villages, following traditional ways of life. They live off the land, often making their own clothing and following particular customs when it comes to births, marriages and deaths. Most live in poorer conditions than the Kinh, with a lack of access to sufficient sanitation and water, no access to health services and far lower incomes. When travelling in the region, clothes may signify what group an individual belongs to, though nowadays many minorities wear clothing more similar in style to the Kinh, reserving traditional dress for celebrations. Flower Hmong women are easily recognisable by their rainbow-coloured clothing, which is quite distinct from the dark indigo — indigo is produced locally – and embroidered clothing of the Black Hmong women. The embroidery, on the collar, belt and sleeves of a Black Hmong outfit helps to distinguish the age and skill of the wearer. The men wear long jackets with shirts and a long waistcoat embroidered at the collar, and a small hat. It’s also difficult to miss the Red Dao women, partly due to their striking red headdress, but also just because of their numbers in Sapa and the surrounding villages. Many are tour guides and if you go on a homestay chances are you will stay in a Red Dao home. As well as the red headdress, Red Dao women wear indigo or black tunics and under trousers with rich embroidery and beading along the sleeves, collar, hem and legs. Men’s tunics are similarly embroidered. Note that Dao outfits vary quite notably across different regions. Ta Phin, a popular day trek from Sapa, is a Red Dao village and here you can see the typical Red Dao home and, if it takes your fancy, take a herbal bath. The Tay minority is the largest in Vietnam, the second largest in Lao Cai, and the earliest known minority to have migrated to modern-day Vietnam. Traditional dress is simple white shirts, indigo trousers and silver adornments. 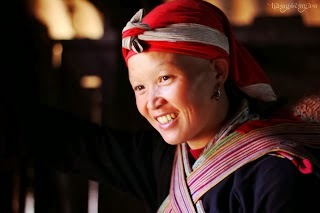 The Tai is the second largest ethnic minority group in Vietnam and includes both the Black and White Tai. The traditional costume generally comprises a coloured blouse with a distinctive row of silver buttons down the front, a long black skirt and an embroidered black headscarf. Tay and Tai houses are built on stilts. The Giay, the fourth largest ethnic minority in Lao Cai, are widely spread; Ta Van village near Sapa is a Giay home, for example. 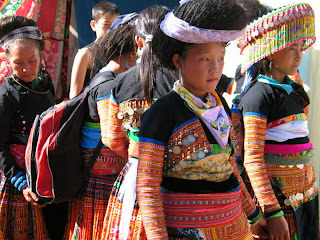 The women dress similarly to the Tay minority, in no-fuss clothes. Blouses are different colours depending on the age of the wearer, with older women wearing darker shades. Women wrap their hair around their head and fix it in place with red threads. The traditional clothing of the Nung people comprises a plain indigo vest and trousers often decorated with a coloured belt and worn with a black turban covered by a white or coloured scarf. This is the same for both men and women. Minorities practise ancestor worship, but while the Red Dao religion has elements of Confucianism, Buddhism and Taoism, Hmong and Tay are primarily spirit worshippers; Christianity is in evidence in some Hmong tribes. Before or after visiting Lao Cai, check out the Ethnology Museum or the Women’s Museum in Hanoi for more comprehensive information on minorities; 54 Traditions Gallery also showcases more than 1,000 antiques, artifacts and art of minority groups and the Kinh. The Sapa Museum also has some limited information, mostly focused on Red Dao and Hmong.